I’m not that alarmed by the way she sprinkles Equal all over the kimchi. My mom uses Splenda — she says it makes it less sticky — though I will be sticking to sugar. There are two good articles on Korean food out this month, very different and yet both true. Saveur‘s article on “The Art of Kimchi” is rich. The author, Mei Chin, has definitely done her research, and you get a sense of how much is expressed in the word “kimchi” — the range of ingredients possible, the diversity of flavors, the importance of its place on the Korean table. She describes watching her friend’s mother doing kimjang, the massive kimchi-making that happens every November for the winter supply. When she tastes the kimchi that’s been prepared but not yet fermented, she says, “It tasted bright and cold and complicated. In fact, it tasted a little like autumn itself, that final burst of color and vitality before hibernation.” Buy the magazine, it’s worth it. Barbara Demick in the New Yorker is writing less about Korean food than the lack of it, as she describes the life of Song Hee-Suk, a North Korean refugee now living in South Korea, and how she tried and failed to keep her family fed during the famines. Only the abstract is available online, so you should buy this magazine as well, but there is a good slideshow narrated by the author online. As I work on this cookbook celebrating Korean food, I don’t ever want to forget that the story of Korean food also includes this, the country’s division and hunger. I tried again, this time with napa cabbage instead of daikon radish. I went the easy route, cutting up the cabbage after brining it for almost 6 hours, instead of the more traditional, more beautiful way of keeping the cabbage whole, with all its nooks and crannies filled and rubbed with spicy paste. But it’s still not quite what I was looking for. Last time, it was too much ginger. This time, too much salt. With all due respect to Martin Luther King, Jr., the best thing about this long weekend was that I finally had time to sit down and make some kimchi. I can’t tell you how it turned out, as I need to wait a few days for it to ripen, but I’m not very hopeful. Right now, it tastes sort of raw and angry, not too spicy, but perhaps a bit too much ginger. Maybe its flavors will mellow and blend as time goes by. But it was my fault, I didn’t follow any one recipe, sort of picking and choosing among two different recipes and then ignoring instructions when I felt like it. I started with a big daikon radish, about 3.5 lbs., that I peeled and cut into large chunks, feeling gratitude towards my friend Diane who gave me a giant cleaver for my 30th birthday. Then I tossed it all with two tablespoons of salt and let it sit for 20 minutes, draining it at the end. In the meantime, I minced 1 teaspoon each of garlic and ginger and 6 stalks of green onions. I measured out the Korean fish sauce that’s used specifically for kimchi making and 6 big tablespoons of ground Korean red pepper. I ignored the instructions to add shrimp because I didn’t have any, and I didn’t know what kind to buy. It was fun, if a little scary, to rub all the ground red pepper into the radish cubes. Then everything else got tossed in, I packed it all into a big Tupperware I’d bought just for this purpose and set it on the windowsill. According to my cookbook, I would have to let it sit for 24 hours in room temperature to begin the fermentation process. So after 24 hours, what can I tell you? It’s started, but I don’t know yet how it’ll taste 2 or 5 days from now. To a certain extent, kimchi will just keep changing and there’s a certain joy in eating new kimchi and a different joy in eating riper kimchi. But there are kimchis where there is no joy at all. In a way, this kind of cooking is particularly good for the anxious soul—you have to learn to let go and just see what happens, and then be willing to try again. Korean food isn’t hard to make. 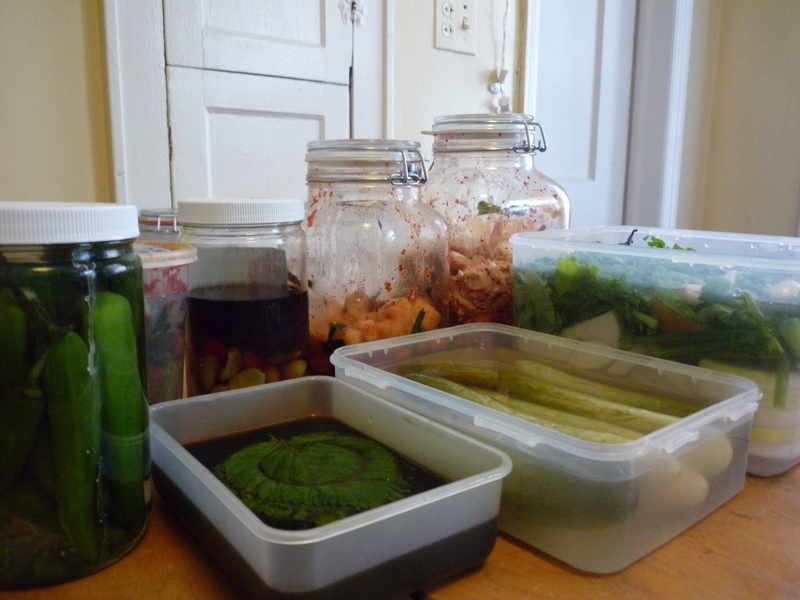 Fermentation, or pickling, just happens if you put the right things together. The hard part is figuring out which combinations make for best balance of flavors. My little Korean lunch, a spicy soft tofu stew, was the same way, not bad but not great. I miss my mother more than ever. You know how when you’re young, you don’t think of your parents as real people? For a long time, I felt that way about Korean food. It wasn’t food in the way Malaysian nasi lemak is food or Oaxacan mole is food, something to be fascinated by. It was like air, something I didn’t notice until it was gone, when I realized I was truly living alone and no one was going to make Korean food for me. Even worse, I realized I didn’t even know that much about Korean food. I would start to answer questions on Chowhound and then stop because I didn’t even know the right name for that whole-radish kimchi I like so much, the one that’s shaped like an elongated pear. (It’s 총각김치, chonggak kimchi!) I can’t identify half of my favorite 나물, namul, or vegetable 반찬, banchan—I just think of them all as “mountain vegetables.” Though I should be able to identify at least one; my mom was picking it off the ground in Fort Greene Park when she came to visit. The museum turned out to be small and fairly low-budget, with clearly some efforts towards interactivity, but with almost no effort to hire a fluent English speaker to do their translations. I learned more from my mother sitting with a Japanese-language kimchi cookbook in the front room. But if you don’t have a Korean mother, and especially if you enjoy looking at plastic food (hello, Sharon! ), it’s not a bad way to spend an hour. If nothing else, you will learn that there are hundreds of kinds of kimchi. That’s why it’s not quite accurate to describe kimchi simply as Korea’s national pickle—it just can’t be described in the singular. They can be made of napa cabbage or regular cabbage, cucumbers, green onions, eggplant, big radishes, small radishes, etc., etc. Even my mom saw types she had never tried, as specialties vary from region to region. My new kimchi cookbook divides its 105 recipes into “Refreshing Northern Kimchi, “Simple and Tasty Seoul Kimchi,” and “Intensely Flavored Southern Kimchi.” There’s some that are fiery red and others that are so mild, you’re supposed to drink the clear, sour juice with the cabbage. The exhibits also explain how kimchi is made, how it was traditionally buried in clay jars in the ground during the winter months, which would control the temperature and keep it from fermenting too quickly. Thus my ancestors ate vegetables through the winter and avoided scurvy. There’s also a funny but poorly translated dig at U.S. soldiers stationed in Korea during the war for stupidly thinking that Koreans were eating food straight out of the ground. Now, nearly all Koreans have special kimchi refrigerators that are colder than regular refrigerators for year-round kimchi preservation. We have one that’s almost twice the size of the washing machine, and my mom says it’s a small one. Sadly, though, younger families rarely make their own kimchi. Sometimes, they’ll buy their kimchi in grocery stores, but as the change is recent, most still get to eat their mothers’ and mothers-in-law’s kimchi. The question, of course, is what will their children eat? I loved Laura Ingalls Wilder when I was young, and I yearned to live in a world where people canned and pickled and preserved things. I didn’t realize it was happening in my own home. But I doubt Koreans will ever stop eating kimchi, no matter how trendy hamburgers and pizza get. My mom and I had a dinner today of rice, two kinds of kimchi, and kimchi stew. And they can always put it on their hamburgers and pizza! Koreans feel no fear in adding their favorite food to all their new favorite foods, as the wall of “kimchi foods” attests. It’s a pity that the museum isn’t more exciting. Perhaps I was focused too much on the poor English translations, but given how central kimchi is to Korean life, the most likely audience would be foreigners, not Koreans. With my newfound enthusiasm and pride in Korean food, I can imagine a museum with truly rich exhibits on the science and the culture. I mean, pickles can be seriously exciting. And then their cross-cultural display could include more than weirdly chilling laboratory jars of sauerkraut and Filipino pickles. But I can’t completely rag on the existing Kimchi Field Museum. After all, you can take pictures with a mannequin ready to feed you kimchi from her chopsticks! There is Korean food in Oaxaca, and it is very good. But the Korean woman who makes the food and her Italian husband are perhaps even more remarkable than the fact of the food’s existence. Gya is married to Sandro, short for Alessandro, who is Italian. They have two children, a daughter named Aruna and a son named Govinda. Since these names are neither Korean nor Italian, and knowing what I do of their story, I imagine that both names are Sanskrit. The family lives high on a hilltop in San Agustin Etla, about 30 minutes outside of Oaxaca City. Of the pueblos I have seen, Etla is the prettiest. The various towns that comprise Etla are all nestled in little dips among green hills, among skies that seem to draw close enough for you to touch. You can walk 50 feet in any direction and find a beautiful view, a buenavista. Gya and Sandro have named their home, “Alegria de Angelis,” or “The Happiness of Angels” in Italian. Here they grow organic vegetables in plots they themselves built, and run a small restaurant by appointment that serves Italian, Korean, and a few other Asian dishes, like momos, the Nepalese dumplings. They grow sweet basil, Napa cabbage, the vegetables essential to their food. They also sell their food at the organic market in Oaxaca at El Pochote and in a newly opened take-out store in San Felipe. Their children swim in the pond with the carp and the turtles. Sometime later, Sandro was traveling through Mexico, with plans to go on to India. A friend of his asked him to go to a particular store in India and buy a dance costume for her. When he got to the store, Gya opened the door. Sandro immediately knew that they would be married, and told her so. Gya told him he was crazy. So Sandro went into the Himalayas to meditate on whether he had had a true revelation. In the mountains, he met an old man who took him into his home. The old man opened a large wardrobe and took out everything, and in the end, there were two ancient rings. The old man said he would give them to him if Sandro gave him everything he had in return, all the clothes he was wearing and all the money he had on him, save what he needed to get back. When Sandro went back to Gya with the two rings, they were married. Sandro and Gya initially wanted to live in India, but found that they, as foreigners, would be restricted in their ability to own land or start a business. So they came to Mexico, traveling from city to city until they stopped at Oaxaca, where it felt right. They have now been in Oaxaca one year. They plan to stay for five years, and then see what happens. The whole thing seems too ethereal to be true, like you’re dreaming by a pond in the mountains of Oaxaca, but they are very down-to-earth-people. Best of all, their firm attachment to the pleasures of this earth is manifest in the food that they serve and the joy with which they serve it. I almost wanted to cry as I spooned my bibimbop into my mouth, as I bit down on the sharp, spicy, almost raw kimchi. It’s strange how much Mexico seems to reveal to me, almost everyday, how much I miss my mother. There was a slightly foreign note to the spiciness, not dissonant, but not quite familiar, and then Gya explained that she has to combine Mexican hot peppers with the bit of Korean hot pepper she’s able to buy in Mexico City. Yet the food was authentic, in the best sense of the word, with love and respect for its traditions. Each component of the bibimbop had been grown, washed, and sautéed just until its flavor became the brightest it could be. The fried egg gleamed. Gya had never cooked until they moved here. She had been a dancer, and in Italy, had eaten Sandro’s mother’s cooking. But, as she said, she remembered the taste, it was in her memories. And so they recreate the taste of the Korean and Italian food they know and love, here in Mexico.